The statistic presents the e-book market share in the US from January 2012 to March 2013. In January 2012, the market share amounted to 26.7 percent. 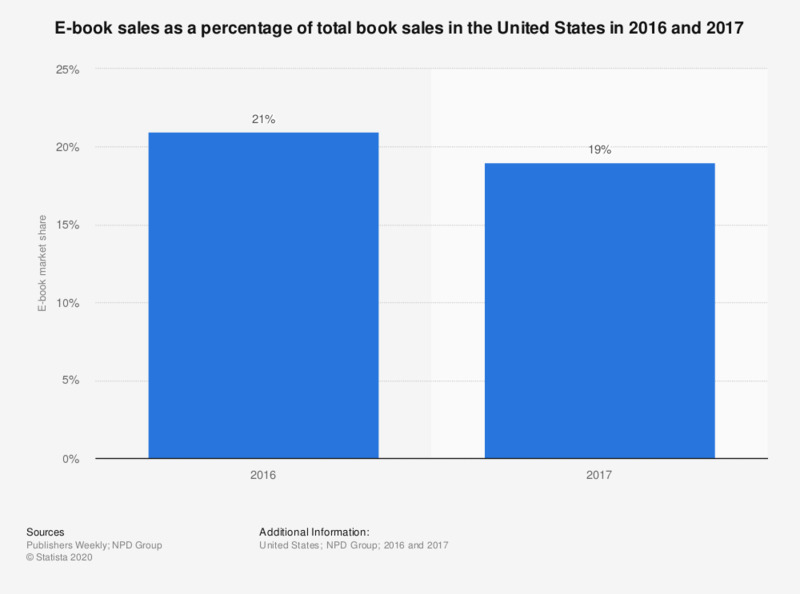 E-book sales have been expanding steadily in the United States and e-books make up an ever growing portion of the US consumer book sales market. In 2009, e-books accounted for a 2.70 percent share of total consumer book sales. By 2012, e-books accounted for 14.9 percent of the book market according to Pricewaterhouse Coopers. E-book sales revenue was 3.3 billion US dollars in 2012. In the period between January 2012 and November 2012, the market share of the e-book fluctuated between a high of 26.7 percent (January 2012) and a low of 17 percent (October 2012). Additional projections from Pricewaterhouse Coopers suggest that worldwide e-book market share could reach 17.9 percent by 2016. The popularity of e-books and e-readers goes hand in hand—consumers are buying the new, mobile gadgets with which they read, amass e-book libraries, play games and shop online for new e-books. According to the results of one survey, the share of Americans using e-readers rose from 15 percent in 2011 to 28 percent in 2012. A source estimated that the (e-reader penetration) was closer to 15.40 percent in 2012, and projected penetration would rise to 19.20 percent by 2016. The leading e-reader vendors worldwide in 2012 were Amazon, Kobo, Barnes and Noble and Sony. Amazon sells the Kindle Fire and holds roughly 55 percent of the global e-reader market. In the American market, the Barnes and Noble Nook accounted for 22 percent of e-reader ownership in 2012. Sales of the Kindle Fire from Amazon reached 5.50 million units in 2011 and were projected to reach 27.8 million units in 2014. Revenue from sales of content from the Amazon Kindle Fire tablet were forecast at 981.9 million US dollars in 2012. * The May and July figures is given as "about 25 percent" / "about 26 percent" by their respective sources. Figures other than for February and March 2013 come from other publications. Data for June and December 2012 not available.